Apple on Thursday shared a new short commercial highlighting the new Apple Watch Series 2, this time throwing a spotlight on the wearable's waterproof design. 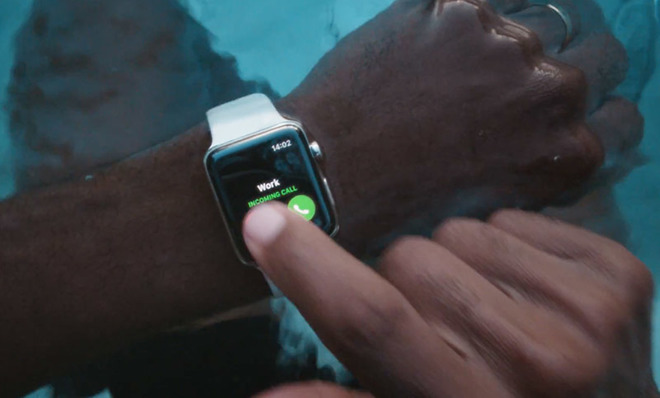 Titled "Go Swim," the new 10-second spot is part of Apple's "Gift of Go" series, a growing class of bite-sized commercials crafted to give viewers a taste of what Apple Watch can do. Each ad is shot from a first-person perspective and starts out with someone unwrapping a new Apple Watch Series 2. Today's spot is no different. In "Go Swim," we see a man break out his new stainless steel Watch, a gift from what appears to be his family. A jump cut takes us into the action, in this case a quick swim session highlighting Apple Watch's new watertight design. Like past "Go" commercials the Watch wearer's arms are seen in the same position from one shot to the next, a filmmaking trick meant to imbue a sense of flow. Apple Watch Series 2 is Apple's first device to sport water resistant, or "swim-proof," design. Whereas the first generation wearable was splash proof, this year's revision can be taken down to 50 meters. As shown in today's commercial, however, the OLED touchscreen is inoperable when submerged. Apple's latest ad arrives as retailers make a last ditch effort to grab the mindshare of holiday shoppers. Apple released its usual heartwarming seasonal commercial in "Frankie's Holiday" last month, part of the firm's "Practically Magic" iPhone commercial series.